Just a suggestion though, lockable and unlockable option to current position, because 'for me' it's a little annoying for it to be dragged when clicking optimize and putting it back again to my desired position. It seems that problems 1 and 4 have been corrected... See point 3 (new italian.ini) and point 2 (with an italian keyboard, the @ character can not be used when registering the product). Two other problems, regarding the translation, in privacy protector/password generator: I can't translate "the password generator will help you create a strong password" and "password length", because I can't find their strings in the english.ini. I think these problems are true for each Language file. 1, About memory size error, we have got it. we will fix it asap. 2, About graphic temperature, I guess your graphic card is an Integrated graphic card. There is a problem to get integrated graphic card temperature, we are working hard to fix it. I don't think this is necessary. v2 has this option, but v3 don't need it. wise care 365 v3 will auto match user's system language. I think this is more easily for user. I saw your disk is 320 GB, all language files are total less than 5 MB. Do you really need to free up 5 MB disk space? Wise care 365 v3 can detect it, but we have not test it. Can you help us to do it? We don't recommend to use it. I don't know when you remove this service whether may cause other problem. This is a part of Wise Care 365. Thank you for your feedback. And thank you for your translation. 1, Sorry, I don't know that is difficult to enter @ for Italian user. But we will try to fix it. If you still cannot find it, you can add it in your file. 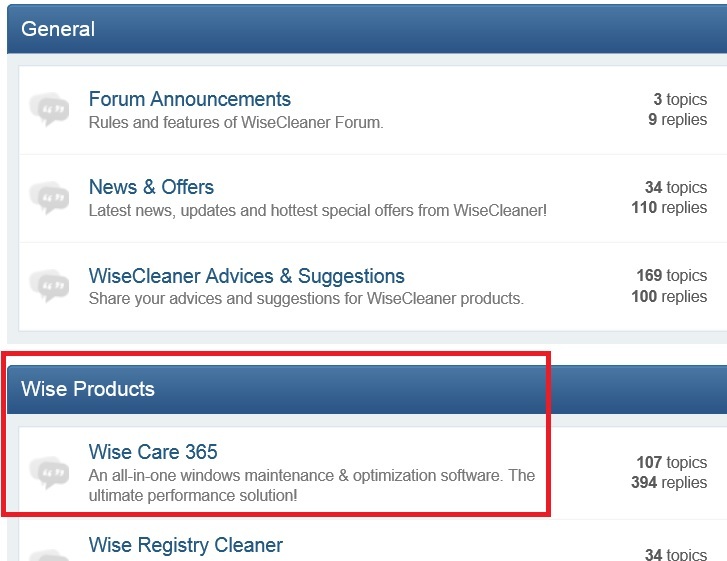 I think that "the module of Wise Care 365" is the other sub-forum section named wise care 365, under the wise products section. In order to make the newly released Wise Care 365 v3 more efficient and perfect, we encourage each of you to write down the suggestions on how to both improve our product and our customer services. We will provide the free license keys for the users whose suggestions we choose to implement. The valid date of the license key is about half a year. If you are already a Pro version user, we will extend your expiry date as a reward. I know the best ideas come from our users, and I look forward to your suggestions.